The above verse points out that the eight Swayam Vyakta Kshetrams , Srirangam, Tirupathi, SrimushNam, Vanamamalai, Salagramam, Badri, NaimisharaNyam and Pushkar grant liberation to those who visit the place and seek Lord’s grace . Elders say the Lord as the Archa Murthy at each of these holy Kshetrams signify one Aksharam of the Ashtakshara Mantram . 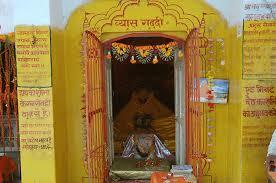 Naimisaaranyam is 120 kms away from Lucknow between Sitapur and Balmau in the state of Uttar Pradesh . Naimisaraanyam is 42 kms away from Shidoli . Naimisharanya is situated on the left bank of the river Gomathi, which is a tributary of the river Ganges . At ” NAIMISAARANYAM” Lord ( Perumal ) is in Aaranya ( Forest) swaroopam. This is a swayam vyaktha kshethram. The Lord here is glorified as Deivapiran and goddess Harilakshmi as Pundarikavalli. Once, few sages went to BrahmA and asked him “In this vast world, which place is the best place for thapas (penance)?”. BrahmA took few thruNam (dharbhaippul- grass) and joined them to make a circle. BramhA rolled the circular (nEmi- circular) dharbhai on the ground and said “Wherever this nEmi stops, let that be the best place for performing thapas”. And it rolled .. rolled and rolled. & finally stopped at this place of dense forest; and hence called as NaimisaaraNyam. The rishis followed the wheel and arrived here. 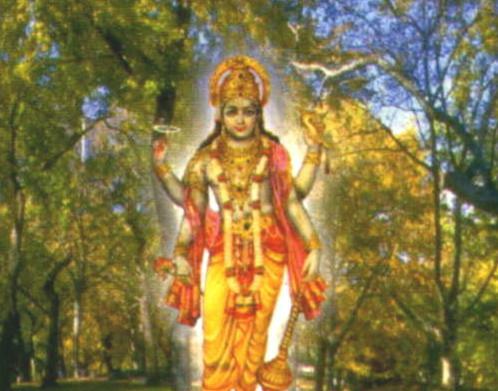 To purify the place, Lord Maha Vishnu sent his Sudarshana Chakra. The place where the Chakram landed became a deep pit and came to be known as Chakra Theertha . It is said to be the center of the universe and the location of Chakra Tirtha has no bottom. Legend says , whoever has a dip in Chakra Theertham will be redeemed from all their sins. Lord blessed the rishis ( saints ) that hereafter this place would be the best place for them to do penance and attain the Lotus feet of the Lord. At the behest of the rishis, Lord decided to s remain there in Aaranya swaroopam. 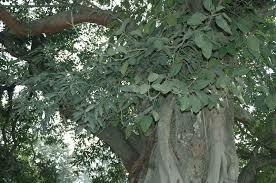 The rishis in due course got transformed into trees and are still doing penance. It is believed that Lord Sri Rama performed Aswamedha yaga at this place after the war . It is also said that this is the place where Goddess Sita Devi was accepted by Mother Earth. Sant Tulasidas wrote Sri Rama Charitha Manas here. The deities of Divyadesam Perumal and Thayar as described in Divya Prabhandham is not to be seen here . 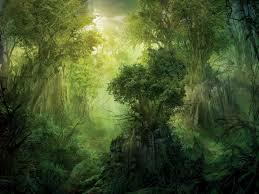 It is believed that around 60,000 sages are still doing penance taking the form of trees. 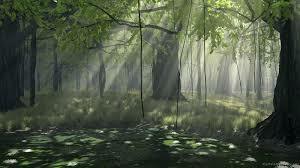 Every leaf in this forest is considered very sacred. We will be graced to enter a South Indian temple Sri Balaji Temple and have darshan of Lord Srinivasa Perumal. On either sides of the Moolavar’s sannidhi, there are shrines for Padmavathi Thayar and Andal. There is also a place called VyAsaghatti, where saint Sukhabrahmam narrated Srimad Bhagawtham, Bharatham to King ParIkshith. It is in the banks of the river Gomathi and is reported to be the place where Veda vyAsa maharishi also performed his thapas (penance) for very many years. There is a temple in this place, called PurANa mandhir wherein Sukhar’s bronze deity with parrot nose is worshipped here and besides this temple, there is a Hanumangatti temple, where HUGE HanumAn shows himself in standing posture carrying Lord Rama, Lakshmana on his shoulders. Vyaas Gaddi also known as Puran Mandir. This is the place where Maharishi Vyasa divided the Vedas into four and wrote 18 puranas. It was here that the famous epic Mahabharatham was composed..
Dadichi Kund is 5 kms away from Mishrik. There is an interesting story connected with this place. The sage Dadichi,used to utter “NARAYANA KAVACHAM” here. The whole episode related to Sage Dhadhichi donating his back bone to the devas happened at at Naimisharanya. He donated his bones to the devas at this ashram to make weapons to defeat the demons (Vritrasura) and the place where the rishi gave up his mortal coils and merged with the Lord by giving up his life for worlds prosperity . ThirumangaiAzhwAr sings on this Emperumaan as “thEnudaik kamalatth thiruvinukku arasE!” (the King of PiraaTTi, who is on honey dripping Lotus flower!) and performs sarangathy to Divya Dampatis, with PiraaTTi for Purushaakaaram (recommendation). 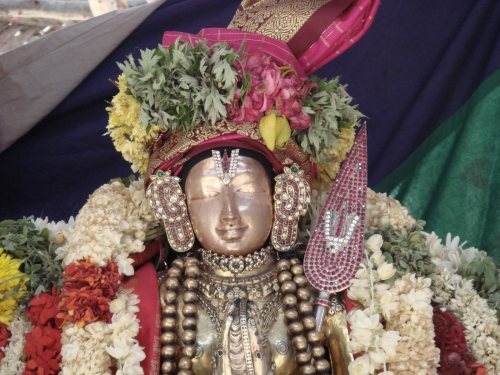 An emotional outpour from Thirumangai AzhwAr evokes tears to any devotee who reads this pasuram …..
the meaning of this beautiful pasuram in English goes like this …. the One who is on Honey dripping Lotus Flower! Oh Lord, who rests on the wavy, huge vast milk ocean! My Lord ! My father! Oh Lord ! My father ……………..
due to Your enormous grace , and….. I am blessed to have realized this, due to Your enormous grace , and…..
dasosmi aham. Dandvath pranams. Hare KRSNA. Just superb. Wonderful! What grace you hv got Prabhu to glorify Krsna like this! Jai HO. Hari Om! Rishis that too 60,000 still meditating as trees! How Holy the place is!